When I was a kid, ice cream sandwiches were all about those rectangular chocolate cake/wafer bars with vanilla ice cream in the middle. To be honest, in my kid brain, they were just okay. I didn’t reach the level of absolute disgust with them as I did with strawberry ice cream, but I never begged for them. Now, that being said, I would absolutely eat one each and every time it was put in front of me. I was a kid after all. When it came to chocolate and ice cream, “no” certainly was not in my vocabulary. 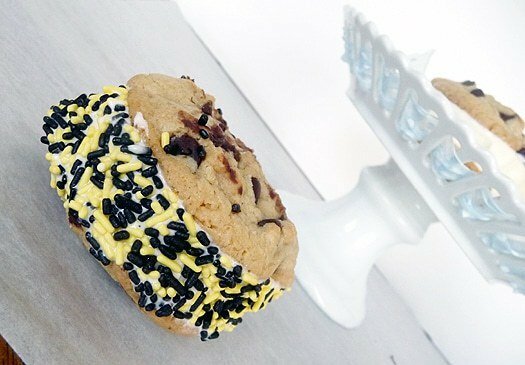 Once I got into college or thereabouts, I discovered the ice cream cookie sandwich. Why hello goodness. This was something I could get behind. And beg for. I loved them. I think my favorite was the Klondike brand, and every time I came home, my mom would have a box waiting for me in the freezer. Aren’t moms the best?? I actually haven’t seen them in the store for a long time now, and walking through the freezer section recently, I was searching for them but didn’t find them. They do have a new variety, but not the ones I fell in love with. I didn’t want new. (Pout much?) 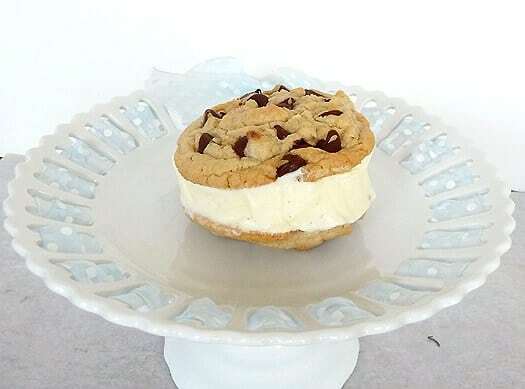 Since I absolutely adore homemade ice cream and the best chocolate chip cookies ever, I decided it was finally time to go homemade with my ice cream cookie sandwich love. Plus, July is National Ice Cream Month. This is a great way to send it out in style! The method here is pretty simple. Bake the cookies and then scoop some ice cream onto the bottom of one cookie, top it with another, smoosh a little, and then roll in whatever kid of sprinkles/chocolate chips/nuts you want. I posed this question to Facebook readers yesterday: Do you prefer cookies or chocolate cake wafers when it comes to ice cream sandwiches? It looked like the consensus was leaning toward cookies; what’s your preference? The perfect snack on a hot day! 1. Make the ice cream and bake the cookies. Let the ice cream sit at room temperature for 10-15 minutes to soften. 2. 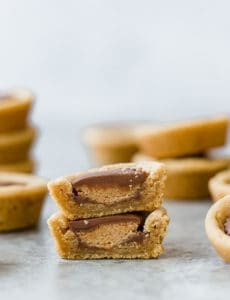 Turn one cookie over and place one (for a thin ice cream layer) or two (for a thicker ice cream layer) scoops of the ice cream onto the bottom of the cookie. *Note 1: I made slightly smaller cookies than I normally do with the Thick & Chewy Chocolate Chip Cookies recipe. I made them 1.5 ounces each and got 24 cookies out of the batch. *Note 2: If you are in the chocolate cake/wafer camp for ice cream sandwiches, you might want to try using the cookie part of the Homemade Oreo Cookies (they will soften after stored in an airtight container). My niece wants to have a ice cream cookie bar at her wedding reception. Do you think it would be best to make and freeze them with the ice cream already in them, or let the guests assemble them themselves? She wants them to assemble them, but I am thinking–mess! I am making the cookies, so I just planned on making and freezing them ahead. They look delicious, and I will follow the directions precisely! 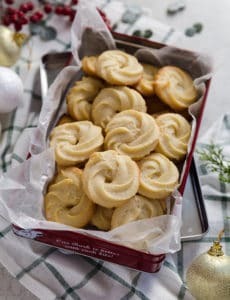 I know the recipe of the cookie states best eaten straight away. 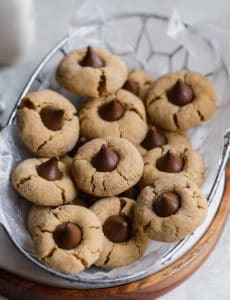 Can the chocolate chip cookies be made a day in advance? I purchased a box of your premium ice cream cookie sandwich at BJ’s. Put them in the freezer when I got home and after lunch I opened the sealed box and it looked like something was wrong. I took each sandwich out of the box and counted them….there were 10 but I paid for 12 and the box show 12 on the outside of the box. You need to reevaluate your quality control cause I got screwed. The box was totally sealed when I opened it so it came from the factory that way. Don’t you weigh these as they come off the assembly line or do you have a discounted employee trying to damage your image with customers. I would be reluctant to buy them again even though I love them. Hi Don, I’m sorry to hear you’re upset about your ice cream sandwiches, I would be, too. However, I think you may have this website confused with an ice cream sandwich manufacturer. Brown Eyed Baker does not manufacture or sell ice cream sandwiches through any channels. Should I cool the cookies before placing them with the ice-cream? 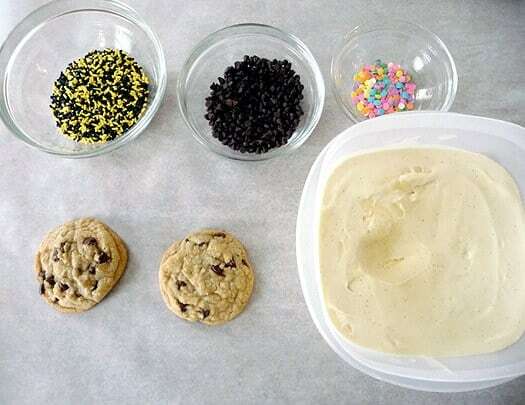 I’ve tried this recipe before and the ice-cream automatically melted when I placed it on the two cookies. Hi Julia, Yes, definitely! You don’t want to use warm, straight from the oven cookies or the ice cream will definitely melt. Let them cool completely to room temperature and then assemble. I am making these as I type. I have made the chocolate chip cookies before, but not the ice cream. So this should be fun. I have never actually made any type of ice cream. I made them and they came out good. The ice cream needed to be a little harder but they were still good. I really need to get an ice cream maker. The kid in me would eat one of these everytime. 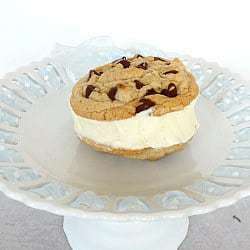 What a great combination – soft chocolate chip cookie and creamy ice cream. I’m pretty much trying to figure out a way to grab one of those through my screen. They look DIVINE! Seriously, seriously delicious!